Bilateral slipped capital femoral epiphysis. One side shows evidence of remodeling of the neck and an anterior bone bump that restricts flexion. The other side demonstrates an acute slip as seen by the absence of any evidence of remodeling. SCFE is not life-threatening. However, untreated and complicated SCFE can lead to deformity and early osteoarthrosis of the hip and thus can cause considerable morbidity. Factors that increase morbidity include avascular necrosis (AVN) of the hip and chondrolysis. Both of these may result in damage severe enough to warrant a salvage procedure, in the form of an arthrodesis or a total hip arthroplasty. Prompt diagnosis is critical to prevent further deformity and AVN. The diagnosis is often subtle, and symptoms (eg, groin or knee pain) can be misleading. The mean age at diagnosis is 13.5 years in boys (range, 13-15 years) and 12 years in girls (range, 11-13 years). This corresponds to the period of maximum skeletal growth. Juvenile SCFE (in children <10 years) should raise the suspicion of an underlying cause (eg, an endocrinopathy). Radiation-associated slips tend to occur in young children. Males are affected more commonly than females are; the male-to-female ratio is 2-5:1. If the SCFE is mild or moderate in severity and is maintained between the femoral head and the acetabulum, long-term outcome is good, and AVN and chondrolysis do not develop. Hips with a severe SCFE and those with AVN or chondrolysis undergo more rapid deterioration with degenerative changes and ultimately require reconstructive procedures. Murgier et al carried out a single-center, retrospective study assessing clinical and radiographic outcomes of in situ fixation for SCFE in 11 hips followed for a mean of 26 years (range, 10-47 years). They found that in moderate-to-severe SCFEs, in situ fixation yielded poor functional results, substantial hip osteoarthritis, and potential femoroacetabular impingement, whereas with minor displacement, it yielded satisfactory functional and radiographic results. The cutoff point for considering other treatment options appeared to be about 30° of slippage. Nectoux et al performed a multicenter retrospective study evaluating the clinical and radiologic evolution of 222 hips treated with in situ fixation and followed for a mean of 11.2 years. In cases of moderate-to-severe initial epiphyseal displacement, in situ fixation led to hip impingement; however, in cases of lesser displacement, it yielded satisfactory function scores, with no clinical or radiologic evidence of impingement. The threshold seemed to be about 35° of slippage; the authors suggested that beyond this value, other surgical options should be considered. Klein C, Haraux E, Leroux J, Gouron R. [Slipped capital femoral epiphysis]. Arch Pediatr. 2017 Mar. 24 (3):301-305. [Medline]. Schein AJ. Acute severe slipped capital femoral epiphysis. Clin Orthop. 1967 Mar-Apr. 51:151-66. [Medline]. Segal LS, Weitzel PP, Davidson RS. 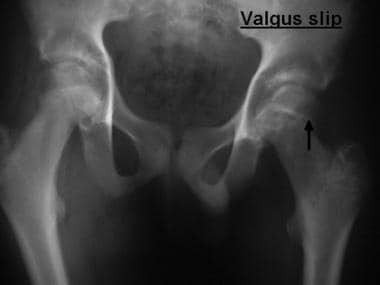 Valgus slipped capital femoral epiphysis. Fact or fiction?. Clin Orthop. 1996 Jan. (322):91-8. [Medline]. Fraitzl CR, Nelitz M, Cakir B, Käfer W, Reichel H. Transfixation in Slipped Capital Femoral Epiphysis: Long-Term Evidence for Femoro-Acetabular Impingement. Z Orthop Unfall. 2009 Jun. 147(3):334-340. [Medline]. Mamisch TC, Kim YJ, Richolt J, Zilkens C, Kikinis R, Millis M, et al. Range of motion after computed tomography-based simulation of intertrochanteric corrective osteotomy in cases of slipped capital femoral epiphysis: comparison of uniplanar flexion osteotomy and multiplanar flexion, valgisation, and rotational osteotomies. J Pediatr Orthop. 2009 Jun. 29(4):336-40. [Medline]. [Full Text]. Gholve PA, Cameron DB, Millis MB. Slipped capital femoral epiphysis update. Curr Opin Pediatr. 2009 Feb. 21(1):39-45. [Medline]. Loder RT, Wittenberg B, DeSilva G. Slipped capital femoral epiphysis associated with endocrine disorders. J Pediatr Orthop. 1995 May-Jun. 15(3):349-56. [Medline]. McAfee PC, Cady RB. Endocrinologic and metabolic factors in atypical presentations of slipped capital femoral epiphysis. Report of four cases and review of the literature. Clin Orthop. 1983 Nov. (180):188-97. [Medline]. Wells D, King JD, Roe TF, Kaufman FR. Review of slipped capital femoral epiphysis associated with endocrine disease. J Pediatr Orthop. 1993 Sep-Oct. 13(5):610-4. [Medline]. Loder RT, Hensinger RN. Slipped capital femoral epiphysis associated with renal failure osteodystrophy. J Pediatr Orthop. 1997 Mar-Apr. 17(2):205-11. [Medline]. Loder RT, Hensinger RN, Alburger PD, et al. Slipped capital femoral epiphysis associated with radiation therapy. J Pediatr Orthop. 1998 Sep-Oct. 18(5):630-6. [Medline]. Abraham E, Gonzalez MH, Pratap S, Amirouche F, Atluri P, Simon P. Clinical implications of anatomical wear characteristics in slipped capital femoral epiphysis and primary osteoarthritis. J Pediatr Orthop. 2007 Oct-Nov. 27(7):788-95. [Medline]. Galbraith RT, Gelberman RH, Hajek PC, et al. Obesity and decreased femoral anteversion in adolescence. J Orthop Res. 1987. 5(4):523-8. [Medline]. Gelberman RH, Cohen MS, Shaw BA, et al. The association of femoral retroversion with slipped capital femoral epiphysis. J Bone Joint Surg Am. 1986 Sep. 68(7):1000-7. [Medline]. Pritchett JW, Perdue KD. Mechanical factors in slipped capital femoral epiphysis. J Pediatr Orthop. 1988 Jul-Aug. 8(4):385-8. [Medline]. Kordelle J, Millis M, Jolesz FA, et al. Three-dimensional analysis of the proximal femur in patients with slipped capital femoral epiphysis based on computed tomography. J Pediatr Orthop. 2001 Mar-Apr. 21(2):179-82. [Medline]. Kelsey JL, Acheson RM, Keggi KJ. The body build of patients with slipped capital femoral epiphysis. Am J Dis Child. 1972 Aug. 124(2):276-81. [Medline]. Loder RT. The demographics of slipped capital femoral epiphysis. An international multicenter study. Clin Orthop. 1996 Jan. (322):8-27. [Medline]. Mirkopulos N, Weiner DS, Askew M. The evolving slope of the proximal femoral growth plate relationship to slipped capital femoral epiphysis. J Pediatr Orthop. 1988 May-Jun. 8(3):268-73. [Medline]. Wiberg G. Studies on dysplastic acetabula and congenital subluxation of the hip joint. With special reference to the complication of osteoarthrosis. Acta Chir Scandinavica. 1939. 58. Exner GU. Growth and pubertal development in slipped capital femoral epiphysis: a longitudinal study. J Pediatr Orthop. 1986 Jul-Aug. 6(4):403-9. [Medline]. Morscher E. Strength and morphology of growth cartilage under hormonal influence of puberty. Animal experiments and clinical study on the etiology of local growth disorders during puberty. Reconstr Surg Traumatol. 1968. 10:3-104. [Medline]. Sorensen KH. Slipped upper femoral epiphysis. Clinical study on aetiology. Acta Orthop Scand. 1968. 39(4):499-517. [Medline]. Brenkel IJ, Dias JJ, Iqbal SJ, Gregg PJ. Thyroid hormone levels in patients with slipped capital femoral epiphysis. J Pediatr Orthop. 1988 Jan-Feb. 8(1):22-5. [Medline]. Eisenstein A, Rothschild S. Biochemical abnormalities in patients with slipped capital femoral epiphysis and chondrolysis. J Bone Joint Surg Am. 1976 Jun. 58(4):459-67. [Medline]. Mann DC, Weddington J, Richton S. Hormonal studies in patients with slipped capital femoral epiphysis without evidence of endocrinopathy. J Pediatr Orthop. 1988 Sep-Oct. 8(5):543-5. [Medline]. Samuelson T, Olney B. Percutaneous pin fixation of chronic slipped capital femoral epiphysis. Clin Orthop. 1996 May. (326):225-8. [Medline]. Wilcox PG, Weiner DS, Leighley B. Maturation factors in slipped capital femoral epiphysis. J Pediatr Orthop. 1988 Mar-Apr. 8(2):196-200. [Medline]. Murray AW, Wilson NI. Changing incidence of slipped capital femoral epiphysis: A RELATIONSHIP WITH OBESITY?. J Bone Joint Surg Br. 2008 Jan. 90(1):92-4. [Medline]. Loder RT, Greenfield ML. Clinical characteristics of children with atypical and idiopathic slipped capital femoral epiphysis: description of the age-weight test and implications for further diagnostic investigation. J Pediatr Orthop. 2001 Jul-Aug. 21(4):481-7. [Medline]. Burrow SR, Alman B, Wright JG. Short stature as a screening test for endocrinopathy in slipped capital femoral epiphysis. J Bone Joint Surg Br. 2001 Mar. 83 (2):263-8. [Medline]. [Full Text]. Ninomiya S, Nagasaka Y, Tagawa H. Slipped capital femoral epiphysis. A study of 68 cases in the eastern half area of Japan. Clin Orthop. 1976 Sep. (119):172-6. [Medline]. Murgier J, de Gauzy JS, Jabbour FC, Iniguez XB, Cavaignac E, Pailhé R, et al. Long-term Evolution of Slipped Capital Femoral Epiphysis Treated by in Situ Fixation: A 26 Years Follow-up of 11 Hips. Orthop Rev (Pavia). 2014 Apr 22. 6(2):5335. [Medline]. [Full Text]. Nectoux E, Décaudain J, Accadbled F, Hamel A, Bonin N, Gicquel P, et al. Evolution of slipped capital femoral epiphysis after in situ screw fixation at a mean 11 years' follow-up: a 222 case series. Orthop Traumatol Surg Res. 2015 Feb. 101 (1):51-4. [Medline]. Hagglund G, Hansson LI, Ordeberg G. Epidemiology of slipped capital femoral epiphysis in southern Sweden. Clin Orthop. 1984 Dec. (191):82-94. [Medline]. Jerre R, Billing L, Hansson G, Wallin J. The contralateral hip in patients primarily treated for unilateral slipped upper femoral epiphysis. Long-term follow-up of 61 hips. J Bone Joint Surg Br. 1994 Jul. 76(4):563-7. [Medline]. Jerre R, Billing L, Hansson G, et al. Bilaterality in slipped capital femoral epiphysis: importance of a reliable radiographic method. J Pediatr Orthop B. 1996 Spring. 5(2):80-4. [Medline]. Dreghorn CR, Knight D, Mainds CC, Blockey NJ. Slipped upper femoral epiphysis--a review of 12 years of experience in Glasgow (1972-1983). J Pediatr Orthop. 1987 May-Jun. 7(3):283-7. [Medline]. Loder RT, Aronson DD, Greenfield ML. The epidemiology of bilateral slipped capital femoral epiphysis. A study of children in Michigan. J Bone Joint Surg Am. 1993 Aug. 75(8):1141-7. [Medline]. Wilson PD, Jacobs B, Schecter L. Slipped capital femoral epiphysis: An end-result study. J Bone Joint Surg Am. 1965 Sep. 47:1128-45. [Medline]. Riad J, Bajelidze G, Gabos PG. Bilateral slipped capital femoral epiphysis: predictive factors for contralateral slip. J Pediatr Orthop. 2007 Jun. 27(4):411-4. [Medline]. Zide JR, Popejoy D, Birch JG. Revised Modified Oxford Bone Score: A Simpler Systemfor Prediction of Contralateral Involvement inSlipped Capital Femoral Epiphysis. J Pediatr Orthop. 2011 Mar. 31(2):159-64. [Medline]. Loder RT. Effect of femur position on the angular measurement of slipped capital femoral epiphysis. J Pediatr Orthop. 2001 Jul-Aug. 21(4):488-94. [Medline]. Green DW, Mogekwu N, Scher DM, Handler S, Chalmers P, Widmann RF. A modification of Klein's Line to improve sensitivity of the anterior-posterior radiograph in slipped capital femoral epiphysis. J Pediatr Orthop. 2009 Jul-Aug. 29(5):449-53. [Medline]. Steel HH. The metaphyseal blanch sign of slipped capital femoral epiphysis. J Bone Joint Surg Am. 1986 Jul. 68(6):920-2. [Medline]. Rhoad RC, Davidson RS, Heyman S, et al. Pretreatment bone scan in SCFE: a predictor of ischemia and avascular necrosis. J Pediatr Orthop. 1999 Mar-Apr. 19(2):164-8. [Medline]. PONSETI I, BARTA CK. Evaluation of treatment of slipping of the capital femoral epiphysis. Surg Gynecol Obstet. 1948 Jan. 86 (1):87-97. [Medline]. Boyer DW, Mickelson MR, Ponseti IV. Slipped capital femoral epiphysis. Long-term follow-up study of one hundred and twenty-one patients. J Bone Joint Surg Am. 1981 Jan. 63(1):85-95. [Medline]. Aadalen RJ, Weiner DS, Hoyt W, Herndon CH. Acute slipped capital femoral epiphysis. J Bone Joint Surg Am. 1974 Oct. 56(7):1473-87. [Medline]. Aronson DD, Carlson WE. Slipped capital femoral epiphysis. A prospective study of fixation with a single screw. J Bone Joint Surg Am. 1992 Jul. 74(6):810-9. [Medline]. Fahey JJ, O''Brien ET. Acute slipped capital femoral epiphysis: Review of the literature and report of ten cases. J Bone Joint Surg Am. 1965 Sep. 47:1105-27. [Medline]. Ward WT, Stefko J, Wood KB, Stanitski CL. Fixation with a single screw for slipped capital femoral epiphysis. J Bone Joint Surg Am. 1992 Jul. 74(6):799-809. [Medline]. Loder RT, Richards BS, Shapiro PS, et al. Acute slipped capital femoral epiphysis: the importance of physeal stability. J Bone Joint Surg Am. 1993 Aug. 75(8):1134-40. [Medline]. Kallio PE, Paterson DC, Foster BK, Lequesne GW. Classification in slipped capital femoral epiphysis. Sonographic assessment of stability and remodeling. Clin Orthop. 1993 Sep. (294):196-203. [Medline]. Kallio PE, Mah ET, Foster BK, et al. Slipped capital femoral epiphysis. Incidence and clinical assessment of physeal instability. J Bone Joint Surg Br. 1995 Sep. 77(5):752-5. [Medline]. Damaceno FL, Santili C, Longui CA. Normal reference values of Southwick's anteroposterior angle in prepubertal and pubertal normal adolescents. J Pediatr Orthop B. 2007 Nov. 16(6):389-92. [Medline]. Carney BT, Weinstein SL, Noble J. Long-term follow-up of slipped capital femoral epiphysis. J Bone Joint Surg Am. 1991 Jun. 73(5):667-74. [Medline]. Carney BT, Weinstein SL. Natural history of untreated chronic slipped capital femoral epiphysis. Clin Orthop. 1996 Jan. (322):43-7. [Medline]. Parsch K, Weller S, Parsch D. Open reduction and smooth Kirschner wire fixation for unstable slipped capital femoral epiphysis. J Pediatr Orthop. 2009 Jan-Feb. 29(1):1-8. [Medline]. Agamanolis DP, Weiner DS, Lloyd JK. Slipped capital femoral epiphysis: a pathological study. II. An ultrastructural study of 23 cases. J Pediatr Orthop. 1985 Jan-Feb. 5(1):47-58. [Medline]. Ponseti IV, McClintock R. The pathology of slipping of the upper femoral epiphysis. J Bone Joint Surg Am. 1956 Jan. 38-A(1):71-83. [Medline]. Agamanolis DP, Weiner DS, Lloyd JK. Slipped capital femoral epiphysis: a pathological study. I. A light microscopic and histochemical study of 21 cases. J Pediatr Orthop. 1985 Jan-Feb. 5(1):40-6. [Medline]. Betz RR, Steel HH, Emper WD, et al. Treatment of slipped capital femoral epiphysis. Spica-cast immobilization. J Bone Joint Surg Am. 1990 Apr. 72(4):587-600. [Medline]. Aronson DD, Peterson DA, Miller DV. Slipped capital femoral epiphysis. The case for internal fixation in situ. Clin Orthop. 1992 Aug. (281):115-22. [Medline]. Strong M, Lejman T, Michno P, Sulko J. Fixation of slipped capital femoral epiphyses with unthreaded 2-mm wires. J Pediatr Orthop. 1996 Jan-Feb. 16(1):53-5. [Medline]. Rao SB, Crawford AH, Burger RR, Roy DR. Open bone peg epiphysiodesis for slipped capital femoral epiphysis. J Pediatr Orthop. 1996 Jan-Feb. 16(1):37-48. [Medline]. Weiner DS, Weiner S, Melby A, Hoyt WA Jr. A 30-year experience with bone graft epiphysiodesis in the treatment of slipped capital femoral epiphysis. J Pediatr Orthop. 1984 Mar. 4(2):145-52. [Medline]. Schmidt TL, Cimino WG, Seidel FG. Allograft epiphysiodesis for slipped capital femoral epiphysis. Clin Orthop. 1996 Jan. (322):61-76. [Medline]. DeRosa GP, Mullins RC, Kling TF Jr. Cuneiform osteotomy of the femoral neck in severe slipped capital femoral epiphysis. Clin Orthop. 1996 Jan. (322):48-60. [Medline]. Velasco R, Schai PA, Exner GU. Slipped capital femoral epiphysis: a long-term follow-up study after open reduction of the femoral head combined with subcapital wedge resection. J Pediatr Orthop B. 1998 Jan. 7(1):43-52. [Medline]. Barmada R, Bruch RF, Gimbel JS, Ray RD. Base of the neck extracapsular osteotomy for correction of deformity in slipped capital femoral epiphysis. Clin Orthop. 1978 May. (132):98-101. [Medline]. Kramer WG, Craig WA, Noel S. Compensating osteotomy at the base of the femoral neck for slipped capital femoral epiphysis. J Bone Joint Surg Am. 1976 Sep. 58(6):796-800. [Medline]. Southwick WO. Osteotomy through the lesser trochanter for slipped capital femoral epiphysis. J Bone Joint Surg Am. 1967 Jul. 49(5):807-35. [Medline]. Meier MC, Meyer LC, Ferguson RL. Treatment of slipped capital femoral epiphysis with a spica cast. J Bone Joint Surg Am. 1992 Dec. 74(10):1522-9. [Medline]. Aronson DD, Loder RT. 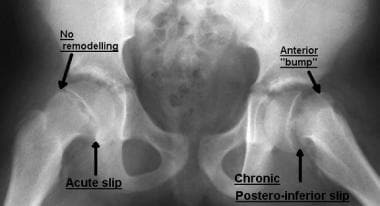 Slipped capital femoral epiphysis in black children. J Pediatr Orthop. 1992 Jan. 12(1):74-9. [Medline]. Crawford AH. Osteotomies in the treatment of slipped capital femoral epiphysis. Instr Course Lect. 1984. 33:327-49. [Medline]. Anand A, Chorney GS. Patient survey of weight-bearing and physical activity after in situ pinning for slipped capital femoral epiphysis. Am J Orthop. 2007 May. 36(5):E68-70; discussion E70. [Medline]. Castañeda P, Macías C, Rocha A, Harfush A, Cassis N. Functional outcome of stable grade III slipped capital femoral epiphysis treated with in situ pinning. J Pediatr Orthop. 2009 Jul-Aug. 29(5):454-8. [Medline]. de Sanctis N, Di Gennaro G, Pempinello C, et al. Is gentle manipulative reduction and percutaneous fixation with a single screw the best management of acute and acute-on-chronic slipped capital femoral epiphysis? A report of 70 patients. J Pediatr Orthop B. 1996 Spring. 5(2):90-5. [Medline]. Peterson MD, Weiner DS, Green NE, Terry CL. Acute slipped capital femoral epiphysis: the value and safety of urgent manipulative reduction. J Pediatr Orthop. 1997 Sep-Oct. 17(5):648-54. [Medline]. Seller K, Raab P, Wild A, Krauspe R. Risk-benefit analysis of prophylactic pinning in slipped capital femoral epiphysis. J Pediatr Orthop B. 2001 Jul. 10(3):192-6. [Medline]. Castro FP Jr, Bennett JT, Doulens K. Epidemiological perspective on prophylactic pinning in patients with unilateral slipped capital femoral epiphysis. J Pediatr Orthop. 2000 Nov-Dec. 20(6):745-8. [Medline]. Ferguson AB, Howarth MB. Slipping of the upper femoral epipysis. A study of seventy cases. J Am Med Assn. 1931. 97:1867-1872. Fish JB. Cuneiform osteotomy of the femoral neck in the treatment of slipped capital femoral epiphysis. A follow-up note. J Bone Joint Surg Am. 1994 Jan. 76(1):46-59. [Medline]. Dunn DM, Angel JC. Replacement of the femoral head by open operation in severe adolescent slipping of the upper femoral epiphysis. J Bone Joint Surg Br. 1978 Aug. 60-B(3):394-403. [Medline]. Novais EN, Hill MK, Carry PM, Heare TC, Sink EL. Modified Dunn Procedure is Superior to In Situ Pinning for Short-term Clinical and Radiographic Improvement in Severe Stable SCFE. Clin Orthop Relat Res. 2015 Jun. 473 (6):2108-17. [Medline]. Javier MJ, Victoria A, Martín D, Gabriela M, Claudio A F. Treatment of Slipped Capital Femoral Epiphysis With the Modified Dunn Procedure: A Multicenter Study. J Pediatr Orthop. 2017 Jan 18. [Medline]. Crawford AH. Role of osteotomy in the treatment of slipped capital femoral epiphysis. J Pediatr Orthop B. 1996 Spring. 5(2):102-9. [Medline]. Schai PA, Exner GU, Hansch O. Prevention of secondary coxarthrosis in slipped capital femoral epiphysis: a long-term follow-up study after corrective intertrochanteric osteotomy. J Pediatr Orthop B. 1996 Summer. 5(3):135-43. [Medline]. Southwick WO. Compression fixation after biplane intertrochanteric osteotomy for slipped capital femoral epiphysis. A technical improvement. J Bone Joint Surg Am. 1973 Sep. 55(6):1218-24. [Medline]. Kennedy JG, Hresko MT, Kasser JR, et al. Osteonecrosis of the femoral head associated with slipped capital femoral epiphysis. J Pediatr Orthop. 2001 Mar-Apr. 21(2):189-93. [Medline]. Razzano CD, Nelson C, Eversman J. Growth hormone levels in slipped capital femoral epiphysis. J Bone Joint Surg Am. 1972 Sep. 54(6):1224-6. [Medline]. Mandell GA, Keret D, Harcke HT, Bowen JR. Chondrolysis: detection by bone scintigraphy. J Pediatr Orthop. 1992 Jan. 12(1):80-5. [Medline]. Kohno Y, Nakashima Y, Kitano T, Irie T, Kita A, Nakamura T, et al. Is the timing of surgery associated with avascular necrosis after unstable slipped capital femoral epiphysis? A multicenter study. J Orthop Sci. 2017 Jan. 22 (1):112-115. [Medline]. Upasani VV, Birke O, Klingele KE, Millis MB, International SCFE Study Group. Iatrogenic Hip Instability Is a Devastating Complication After the Modified Dunn Procedure for Severe Slipped Capital Femoral Epiphysis. Clin Orthop Relat Res. 2017 Apr. 475 (4):1229-1235. [Medline]. Frog-leg (Lauenstein) lateral view, showing a mild slip that can easily be missed on an anteroposterior view. Klein line (line drawn along the superior border of the neck intersects less of the capital epiphysis than on the unaffected side). Southwick head-shaft angle (angle between the metaphyseal surface of the physis and the shaft of the femur on a frog leg lateral view). Difference from the opposite side is used to grade the severity of the slip. Chronic slipped capital femoral epiphysis showing the extent of remodeling along the anterior neck (arrow). Pin placement (anteroposterior view). A: The entry point must be at or above the level of the lesser trochanter to avoid the risk of subtrochanteric fracture. B: The pin (screw) should be in the center of the epiphysis. C: At least 2.5 threads engaging the epiphysis should be used for a secure hold. Pin placement (lateral view). Arrow shows entry point in the anterolateral cortex. Osteotomies in slipped capital femoral epiphysis (SCFE). A: Subcapital osteotomy. B: Base of the neck compensatory osteotomy. C: Intertrochanteric compensatory osteotomy. Note that the amount of correction increases from subcapital to intertrochanteric osteotomies. Principle of the Dunn osteotomy. Reduction of the slip after shortening the neck to avoid stretch on the vessels and decrease the risk of avascular necrosis.